The Northfield Young Men’s Christian Association (YMCA) building has served as a community gathering spot since its construction more than a century ago. 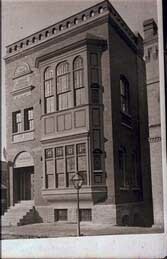 The YMCA building at 304 Division Street opened to the public on December 10, 1885. It was the first YMCA building in the state located outside of the Twin Cities. Designed by Minneapolis architect G.M. Goodwin, it cost $7,000 and was paid for mostly through local contributions. In the early years, the building’s lower level housed a gymnasium; the main level housed the city library, reading room, and parlor; and the top level was used for meetings that could accommodate up to 400 people. The use of the building declined after the construction of other facilities in town, like the Northfield Public Library and the Sayles-Hill gymnasium at Carleton College. The YMCA closed, and in 1915 the building was deeded to the city for $1 for public use. Improvements were added, such as central heat, electricity, water and sewer, and the front door was lowered to its present level above the street. The space reopened in 1919 as a community building. The Northfield Community Club, a precursor to the Northfield Chamber of Commerce, raised more than $11,000 for the repairs through local donations and a $5,000 challenge grant from Carleton Professor Fred Burnett Hill and his wife, Deborah Sayles Hill. In the new configuration, the building’s basement became a meeting room, and the main level provided space for the mayor, the city recorder, the city council, the police, a municipal courtroom, and also for public men’s and women’s restrooms. The top floor was used by the Northfield Community Club; it featured a reading room overlooking the street, a card room and a billiard room. The use of the building changed again over the next few decades; from the mid-1930s to the mid-1950s, the American Legion used the top floor, and by the late 1950s, city government offices had expanded into the upper level. In 1972, after the police department had moved to the new safety center building on Fifth Street, the city proposed selling the old YMCA building. However, city residents voiced their disapproval of this plan, since the building had been constructed and remodeled largely by the public. The city withdrew the plan, but it proposed selling the building again in 1978, when city offices moved to the old Washington School site. Citizens again voiced their desire for the building to remain in use by the public, and it was turned over to the Northfield Arts Guild. The Northfield Arts Guild renovated the building’s façade and reconfigured the interior spaces; the lower level is currently used for classroom space, the main level houses a gallery, gift shop and office, and the upper level houses the dance studio and additional classroom and gallery space. The nonprofit organization remains committed to the building’s use as a center for community activities in the arts.